Pre & Post Workout Protein Recovery Drink that is Paleo! After many months of researching, shopping, and trial and error; I have finally found a solid pre-workout and post-workout protein recovery drink that works with the Paleo Challenge! You have no idea how hard it is to find a paleo-friendly powdered protein source that doesn’t add sugars (real or fake), soy, dairy products, artificial flavors, etc. But, I finally found a source of pure powdered egg whites with nothing else added. Nothing! I mentioned my new protein powder source yesterday. It has a pretty neutral, blah taste. 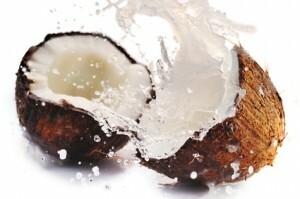 So, I add it to coconut water to give it a better, sweeter taste and get the health benefits too. Coconut is a great food source when you’re on Paleo! 8 oz of pure coconut water. I really like the one that I found at Whole Foods (Amy & Brian Natural Coconut juice with pulp), since it gives a richer and sweeter taste. Gives me 19 grams of carbs and 0 fat. 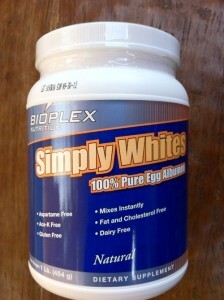 One scoop (30 g) of Bioplex pure egg white powder. Gives me 23 grams of protein, 3 grams of carbs, and 0 fat. Small dash of cinnamon, which helps the flavor and has health benefits too (aids blood sugar control, reduces cholesterol, and improves weight loss). I use less pre-workout and more post-workout, since too much cinnamon can upset my stomach. 8 oz of pure coconut water. 19 grams of carbs and 0 fat. One scoop (30 g) of Bioplex pure egg white powder. 23 grams of protein, 3 grams of carbs, and 0 fat. A little tip from me to you: Don’t mix it up the way you normally would do with a typical protein powder mix in a shaker cup. I ended up with a big frothy mess that was almost impossible to drink. Great for waffles. Bad for drinking. 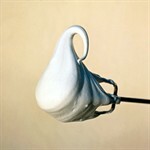 Fewer, gentle shakes is the trick or have the patience to mix with a spoon or whisk. You can also add a bit more fruit and use your blender to make a fruit smoothie. But, I would only do that for the post-workout recovery drink. I think it would be too much for a pre-workout drink. Let me know how it works for you! Admin note: Only the flavored versions. You have to get the “Natural” one. Im Großen und Ganzen ist es bei dem Oberthema Pre & Post Workout Protein Recovery Drink that is Paleo! Detail kontrolliert werden, damit man nichts falsch versteht. Dies scheint hier auf der Seite 100%ig das Normalste der Welt zu sein. Genau deshalb schmöckere ich hier auch oftmals aufs Neue. have here on this post. I am returning to your blog for more soon.